I have decided to take part in the Zero-to-Hero 30 Day Challenge at the Daily Post, and this is Day 1 of the challenge. This is the very first blogging challenge I have ever taken part in, though since starting my blog just over a year ago, I have come across many. I think this will be fun, and it will get my mind going in fresh ways as a writer. At least, this is my hope… and everything really is what we make of it, isn’t it? This post is meant to be all about introduction, and I believe at its core, it is meant to be about soul-searching and self-discovery about why participating bloggers have started to blog. A fair bit of info is covered on my About page, but this is a great opportunity to go a bit deeper. It has been a year after all, and everything changes with time. I first started to blog because I wanted a way to keep track of my children’s experiences and stages of growth, and since I am far from being a good scrapbooking type of person or anything of the sort, and since I love to write, I thought that blogging would be a good marriage of the two. I did love it – but soon realized that I was not entirely comfortable with posting loads of photos of my children on the internet. And so, it evolved. My website is for my work, and it has a blog attached to it. This particular professional website blog is generally only tended to about once per month. I realized quickly that keeping up with this new “mom blog” was a lot more work. I began to write more and more about the sorts of things that I write on my professional blog – about being a yoga and dance teacher, a healer and a movement therapist. I was not comfortable with my professional work seeming to appear so separate from my motherhood aspect of life, as since I live it every day, the two are inextricably intertwined. There was so much reading I had done about blogging, and how moms could stay at home and blog for income while raising their children. While doing this reading, I also came across plenty of mom bloggers that were writing about how frustrated they were, that their blog was so important and therapeutic to them, and that it had started to earn them some residual income, but they felt that it was taking them away from their spouses and their children. Ahhh, the irony. There were of course, plenty of mom bloggers that didn’t write about having this problem at all, and plenty who seemed to have struck a good balance between family and blogging. I decided to let go of all ideas, tools, seminars, how-to’s… and just write. I didn’t want to write in the same way that I do for my professional blog, as that is a very streamlined sort of audience. However, I could not get away from writing about similar topics such as the environment, natural health, preventative medicine, and the like. It always came out, somehow. This is because as a mother, my main concern is keeping myself and my family as vital as possible. Feeding them organic food wherever possible. Giving the children baths with loads of bubbles that are not loaded with chemicals. Researching new ways of moving toward a healthier, sustainable planet that will, as my ancestors so pressed for, create a world that will sustain our children and grandchildren for at least seven generations ahead of ourselves. And still, I am a Taurus woman with a Leo rising and an Aries moon. (I didn’t lose you there, did I? Phew!) So as far as that goes, it hints towards my firey passion and love for finer things. This also points to my understanding that we are not past the point of needing to purchase. We can try to garden, but for now we will still need to buy food too. We can try to go without cosmetics, but sometimes we want to do ourselves up, and of course we still need to wash our hair and skin. And we need to be creative. So if we create art through any sort of media, we will need to purchase tools. We need to keep our creative spark, and hope, and voices, very much alive. So still, we vote with our dollars. Change can be created this way. It is because of this, that once I began being approached by various partners wishing to advertise and affiliate with me, I chose to do so. So long as they were trying to help the earth, came forward with a pure voice, and moved toward creativity and sustainability. Therefore, this blog is still about, and for, my children. It is our next generations that will carry the new world forward, but it is us that will plant the seeds for them. My hope is that through my blogging adventure, I will meet more like minds… women, men, children, parents, writers, creators and healers that will join forces with purpose and authentic voice. Let’s do this thing. Hi Danielle. I enjoyed this post. I am curious about your roots. My family and I lived on the Navajo Reservation for 7 years and your post reminded me of being there. I love that you are working at striking a balance. It is easy, in this day and age, to lose sight of that. Good luck on your venture. Hey! I’m also part of Zero to Hero! Liked your blog, following. Hope you continue the challenge! Thank you Danni 🙂 I am looking forward to keeping up with your work on this blogging challenge, too! I am finding more and more kindred spirits in this world than I ever dreamed. Nothing gives me more hope than to read another Mother doing her utmost to leave this world a better place. Let’s be intent on finding more women like us! I love the quote about being grateful (in the pic). 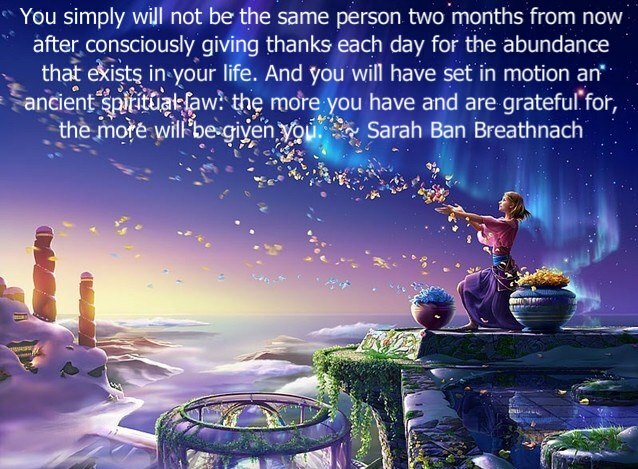 I am nearing the end of a month long “experiment” on giving thanks and consciously feeling blessed. I have been blessed by it and I know that gratitude is something i will want be part of my psych for the rest of my life. Thanks Kabamba! I love gratitude practices. Shifts and changes in one’s life really become apparent with these practices. Blessings on your journey!